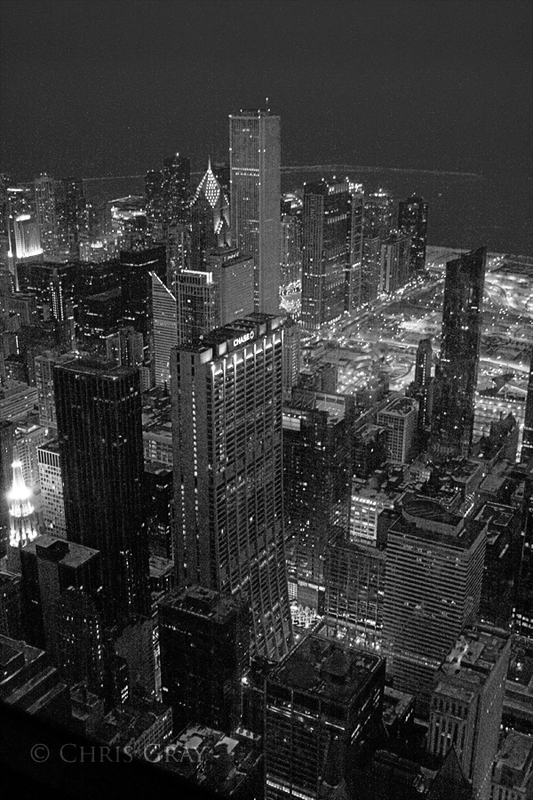 Taken from the observation deck in the Sears Tower. Navy Pier is wonderful to walk on. There's so much to see, and do, on this structure sticking way out into the lake. And looking back on the city from the pier gives such great views. 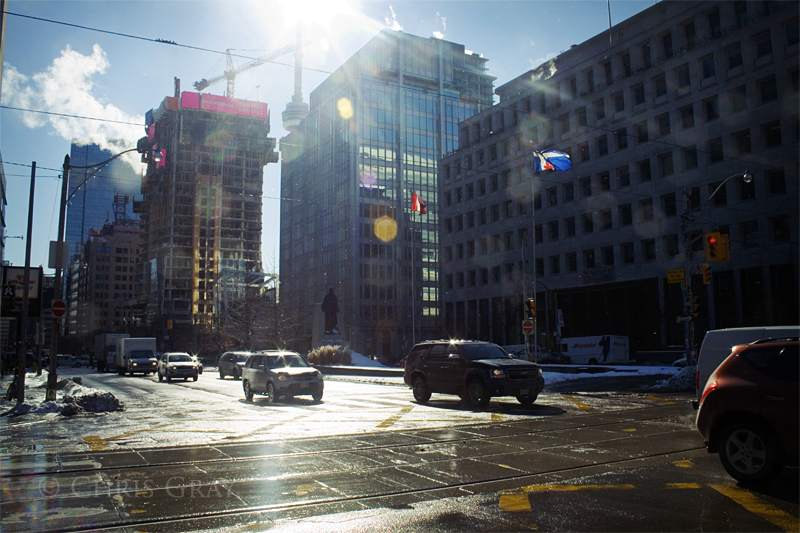 As you can see, we were lucky enough to visit the city during a warm spell in February. 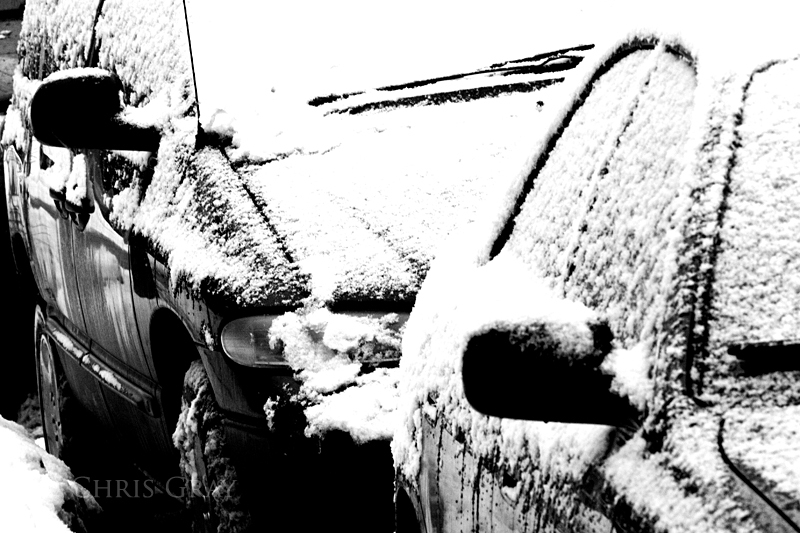 Only a week before, weather was bad enough that people ended up trapped on the highway because of the snow. The evidence of that snowfall was all over the city when we arrived, but it quickly started to melt as the temperatures rose to almost 10C. 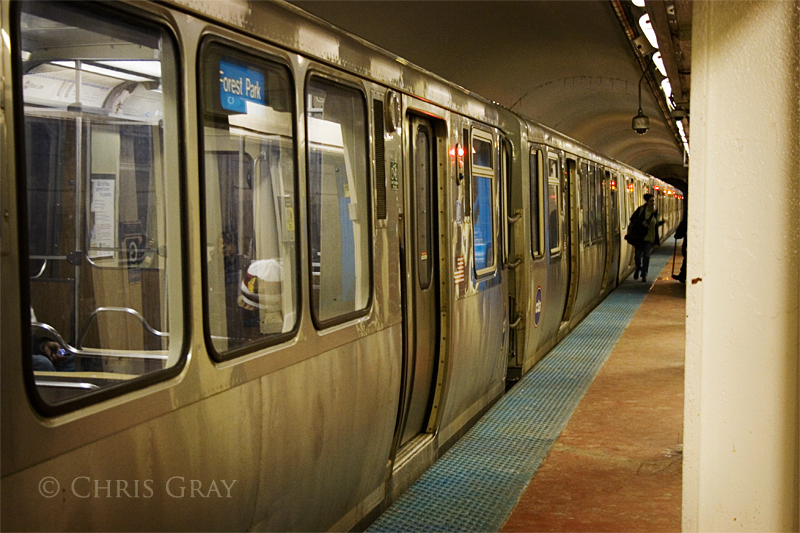 I love the look and the cleanliness of the Chicago Subway trains. There were a lot of features of the trains that I liked - such as the recorded messages telling you not only which station the train is pulling into, but also which side of the train you'll be exiting by. I loved that the train travelled along the center median of a major highway, too - such a smart city planning decision. Another view of Chicago's skyline -this time from the top of the Sears Tower (now known as the Willis Tower). 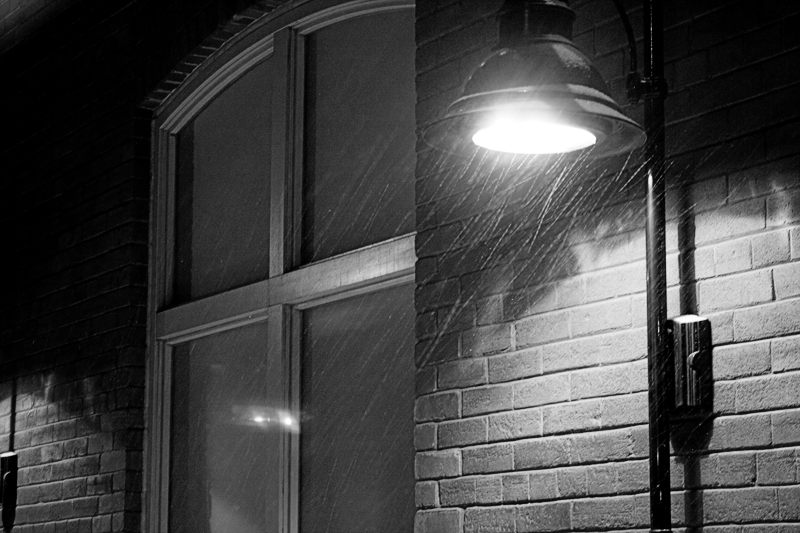 It's hard taking night shots with the Rebel - I find myself envying my wife's Canon 5D. If I'd taken a tripod with me, it would have been better, but we had been walking around all day, and carrying a tripod for that long without using it would have been annoying. This, and other shots from the tower, were taken at ISO 800 or ISO 1600, hand held, from behind glass, and they didn't turn out too bad at all. 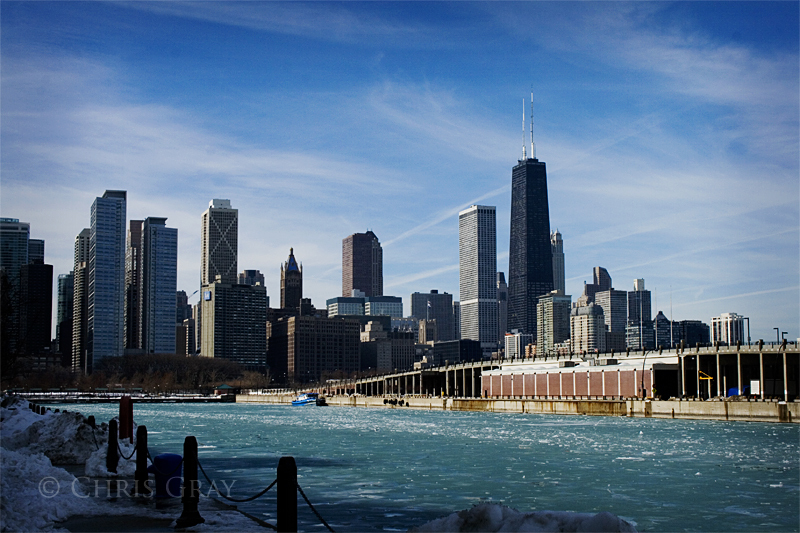 I love Chicago's skyline - especially the view from Navy Pier. It juts out into the lake for a really long distance, and it's covered with attractions and rides. There's even a Shakespearean theater on the pier! The tall black building that looks like a giant taser is the John Hancock building - the second highest building in the city, I think. We stood at the bottom of that later on in our visit. Close up of the theater in the previous photo. We need more decorative touches like this in Toronto. 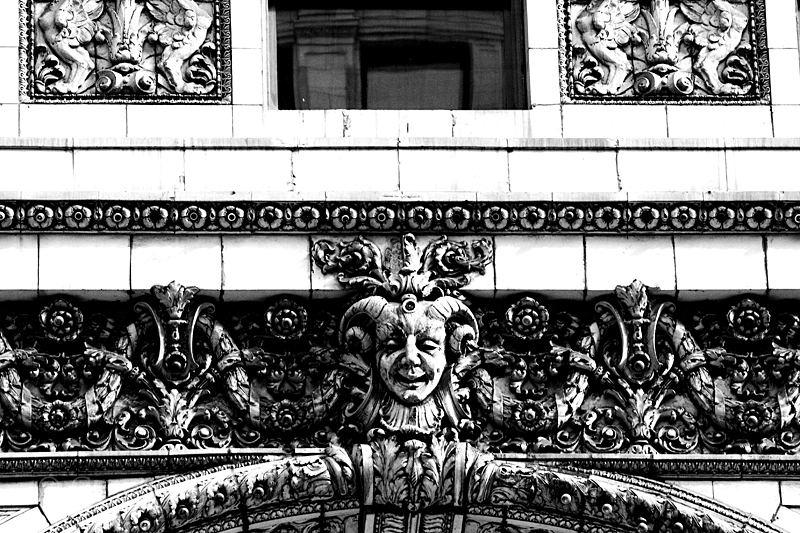 One of the things I loved in Chicago was the number of older, more decorated buildings still around. Can you guess what city this theater is in? I love the detail on the building - and the way it stands out next to it's neighbours. 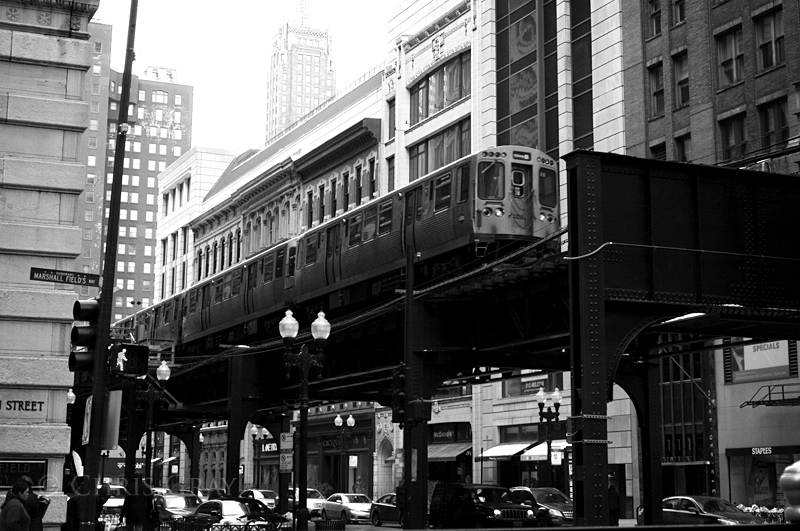 One of the more interesting features of Chicago is the mix of lower and upper streets. It gives you an opportunity to take interesting streetscapes, like this one, from the bridges spanning the lower streets. I loved the canyon effect brought on by the tall buildings on both sides, but I imagine that it could be oppressive if you don't like city living. As for me, I'm a big fan of living in cities, so I just find it to be exciting. The Chicago River runs through downtown Chicago, and it's spanned by a number of different bridges. Each of these is a drawbridge, and they go up when large ships travel up river. The view through the buildings is fantastic, and I'd love to see these up sometime. 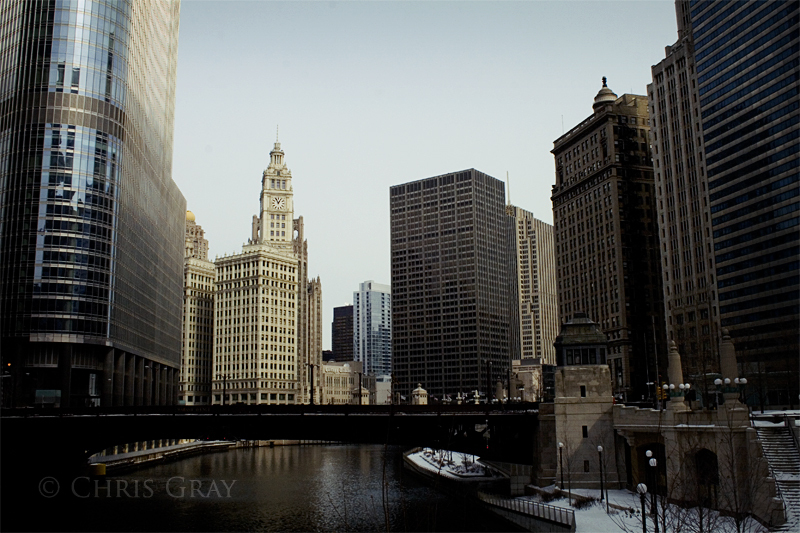 Once again, you can see the different styles of building in the downtown Chicago core from this photo. 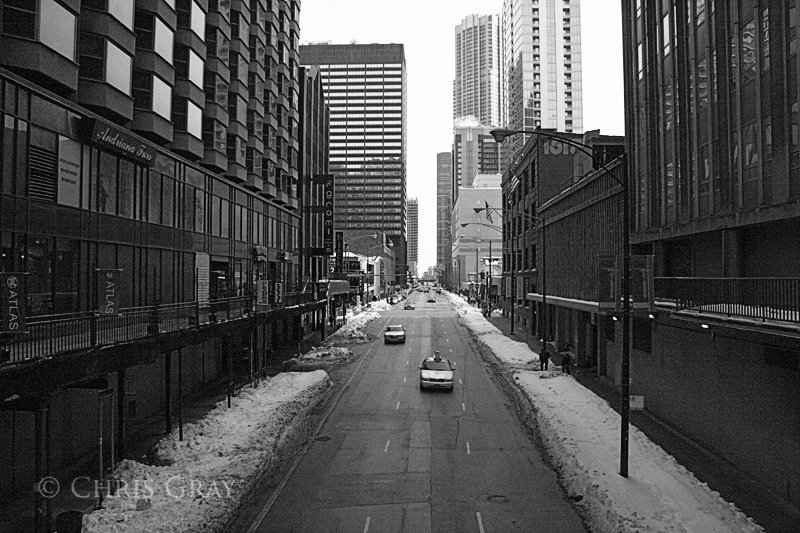 I loved the concentration of fantastic architecture in Chicago's downtown. 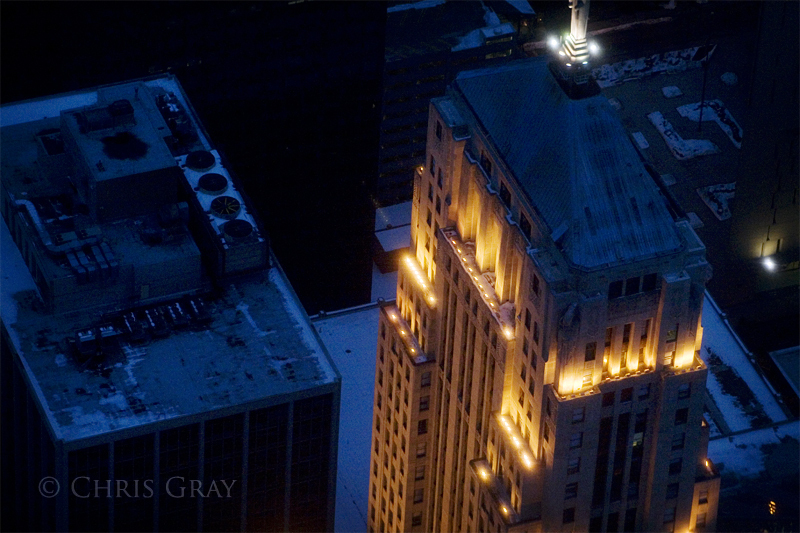 There were more tall buildings clustered around the downtown than you could shake a stick at. 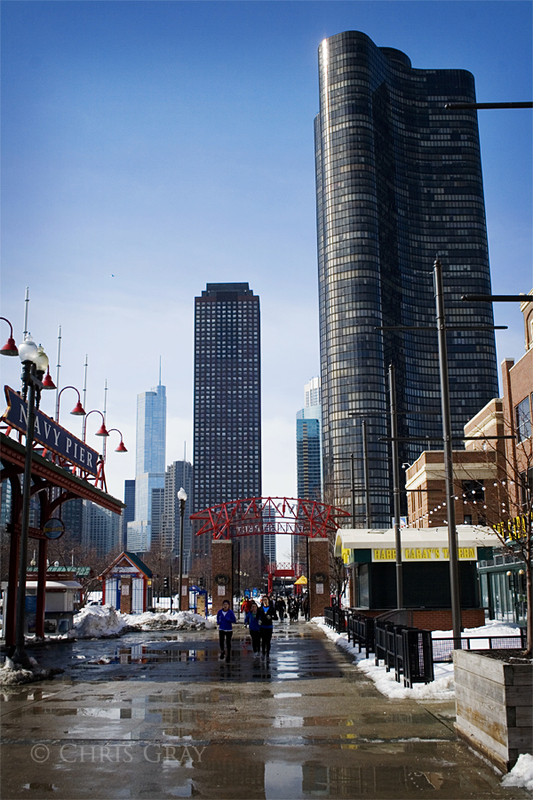 Not surprising, as Chicago is widely cited as the birthplace of the modern skyscraper. 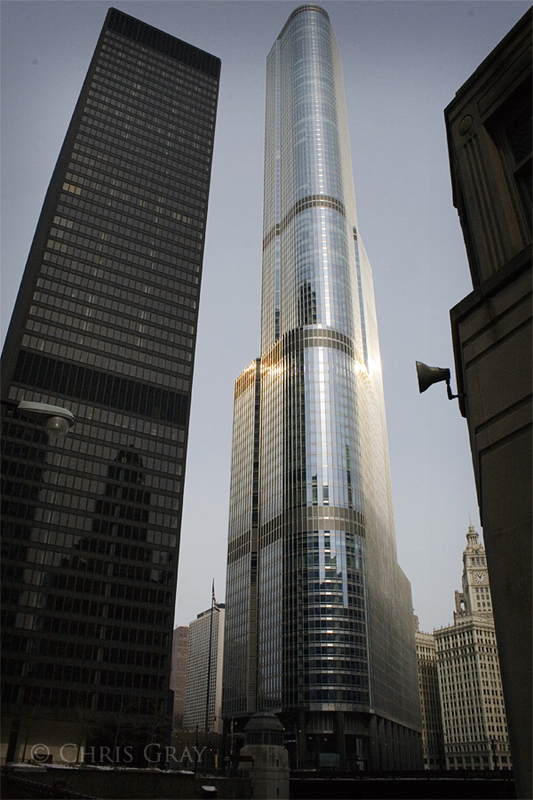 The Trump Tower is an example of the modern practice of glass and steel exteriors, and it's an impressive sight, as you walk down the street. But as you can see from the other buildings in the shot, there are a wide variety of different structural styles in the city. The steel and glass looks clean, and is impressive on one hand, but I think I prefer the more ornate and organic looking buildings that I saw elsewhere. 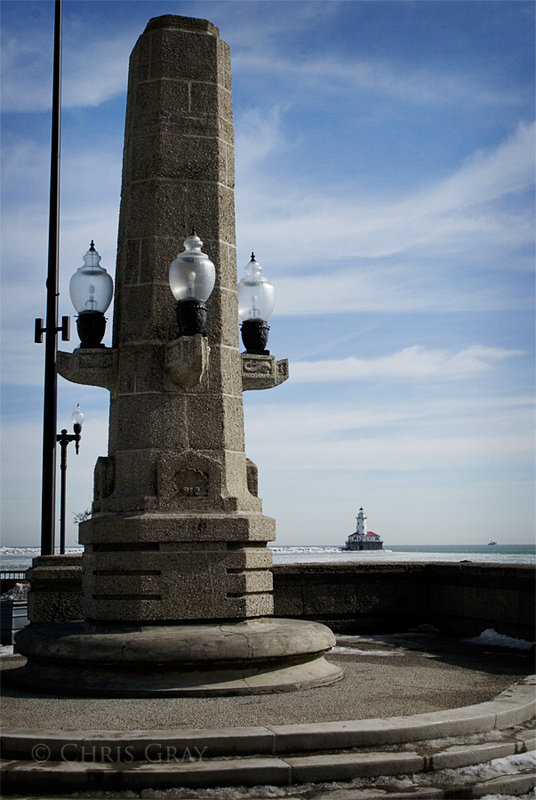 The day we got to Chicago was warm - unseasonably warm. Melting snow and ice had formed these huge ice structures, and the 45F temperatures had everything dripping. 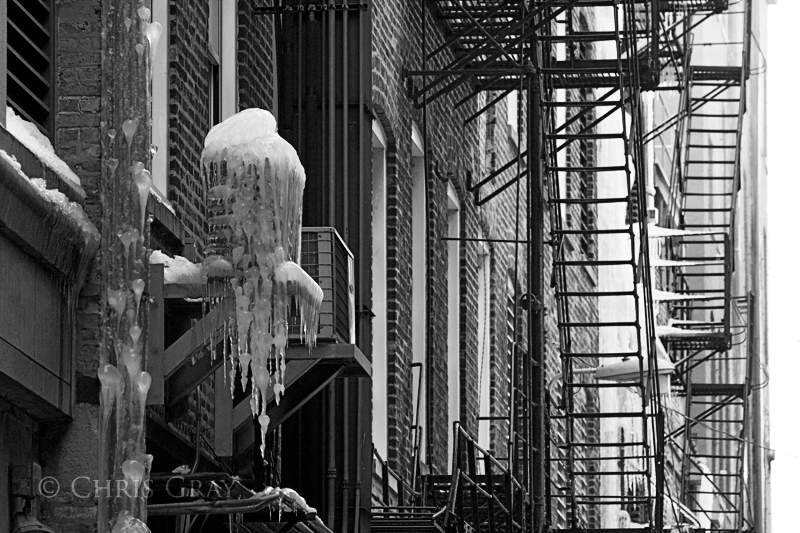 When we planned to go to Chicago in December, I was worried about being cold as we wandered around. When that got rescheduled to February, I was even more worried about temperatures. But we wandered around the entire weekend feeling overdressed and warm, not even needing hats or scarves through most of it. 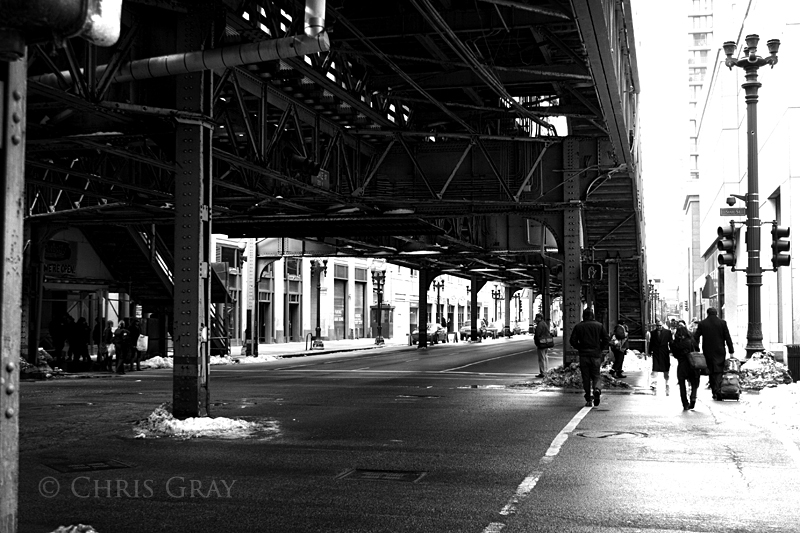 Some of my most enduring impressions of Chicago come from "The Blues Brothers" - I remember scenes of Dan Ackroyd and John Belushi racing underneath the elevated subway tracks in Chicago. 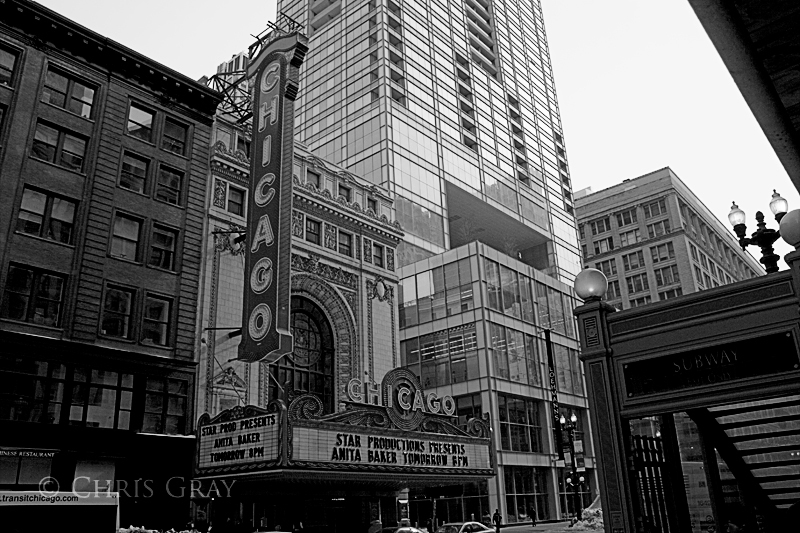 A little while ago, my wife and I made a pilgrimage to Chicago, and took the time, between fabulous diner eating, to take a bunch of photos of the downtown area. This particular shot was taken on the first day of our visit. 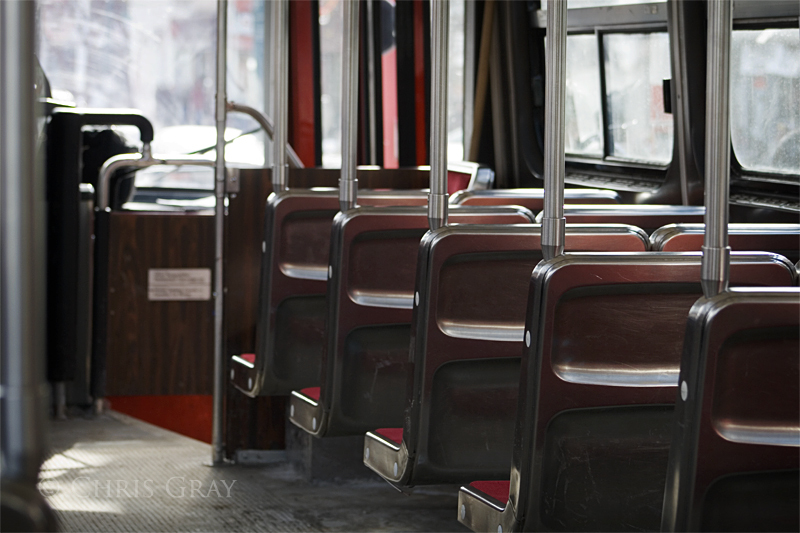 Empty streetcar on Spadina. I occasionally have to run up to Spadina and College on my lunch hour, and it's rare that I get onto a streetcar without anyone else on it. But this time, I managed to find one that nobody else needed. Of course, it came just after and just before another one, proving that when you don't want streetcars to arrive, they're always there. At least this winter FEELS like a winter. Last year didn't feel like winter very often - more like an extended, depressing fall. I like it when we get snow. I even like the cold, believe it or not, it makes me feel like there's a reason to spend time indoors. 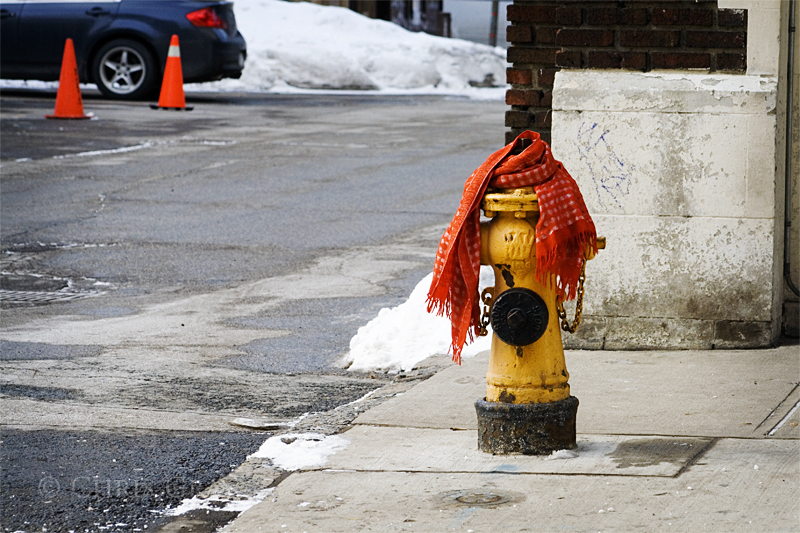 Okay, I know it's been cold in Toronto, but I don't think it's been THIS cold. Okay - this is an older photo - I took it back in October. 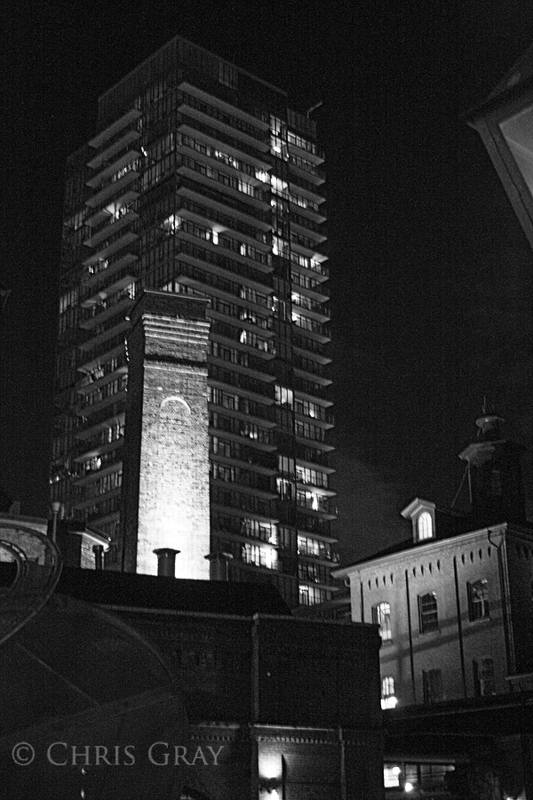 But doesn't the Distillery District look spooky-awesome at night? I have to go back there with a tripod and take a bunch of night shots. 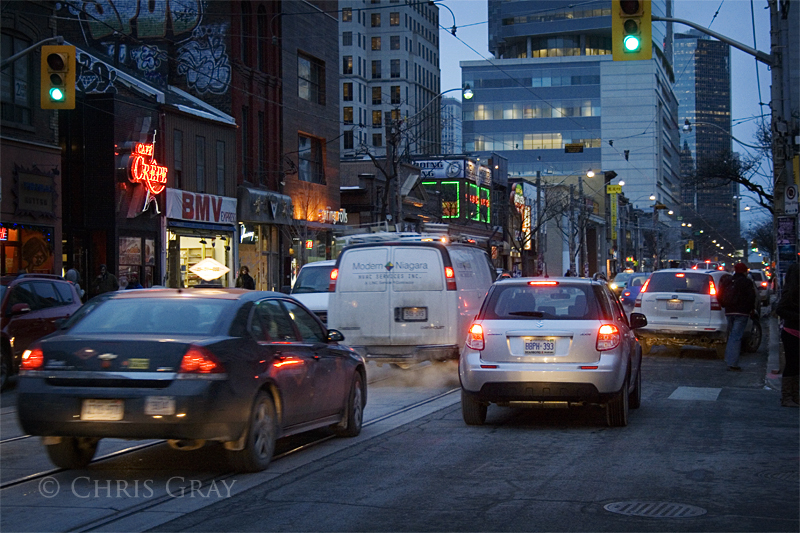 A driver waits to pull around a stopped car on Queen Street, as Justin Bieber performs at Much Music. Traffic was pretty heavy while Justin was performing, but I don't really think that too many drivers were trying to catch a glimpse of him as they zoomed past. It's always interesting to stand at the bus stop at Queen and John and wait for a streetcar while one act or another performs there. Inevitably, the performances are going on at 5pm, when everyone is leaving. That's part of the charm of the city, though. I love the way the sign looks when the steam is billowing around it. 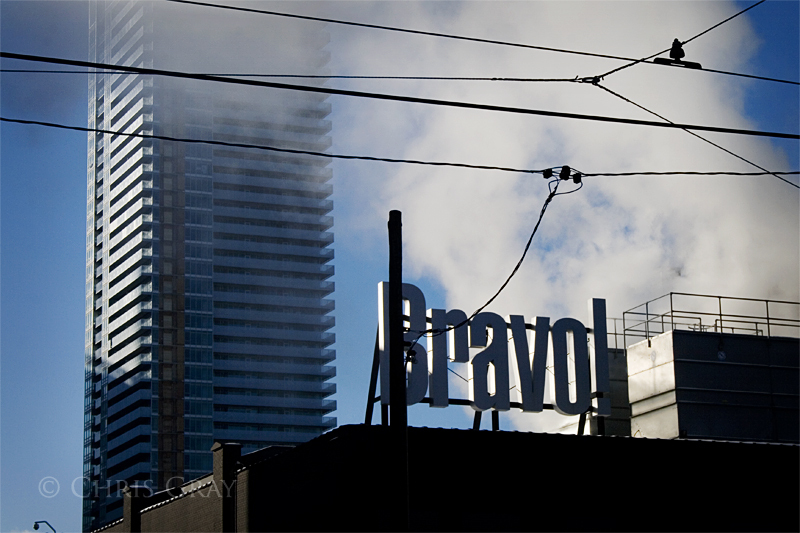 Bravo used to be one of the stations I watched a lot - their studios are located just south of my work, at the intersection of Queen and John. I haven't watched too much on there lately, though - there just doesn't seem to be as many programs on there that I want to see. As you can see, we had some sunshine recently. It was wonderful to get out of the office and walk over to City Hall under clear skies. 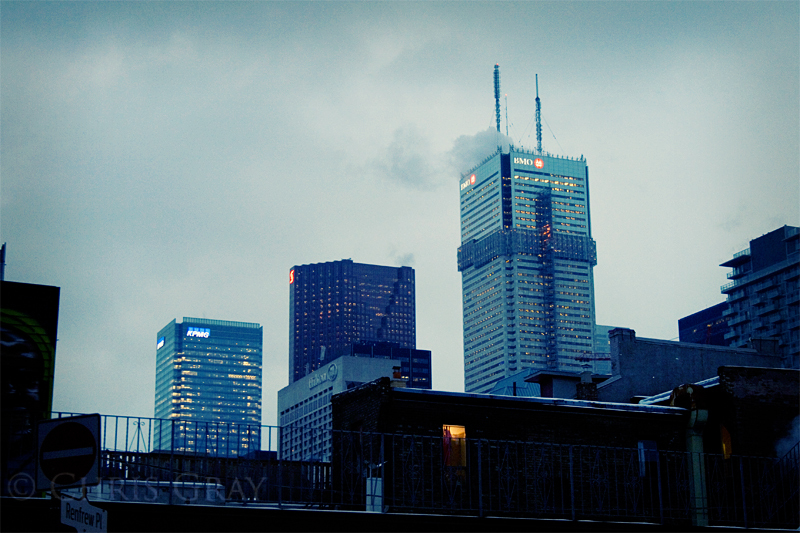 Some of the bank towers of Toronto's Financial District, as seen from John Street. These towers loom over the city, much like the related institutions loom over the economy. And here is another of the photos taken on my birthday photowalk. Liberty Village is a wonderful part of the city, very interesting to see, and I'll be certain to head back there again - preferably in the warmer weather. As you can see, it was snowing by the time we left to go home. What you can't see is that it was annoyingly cold. It's a wonderful tradition we have, of taking the day off for our birthdays, and going around the city taking pictures. But there are times when I wish that our birthdays weren't both in the winter.